I have said this before to my young skater friends and their parents, but with regional qualifying competitions well under way, I feel it bears repeating: Success in competitive skating is not a sprint, it is a marathon. When you're just out of the starting blocks and headed for your first 100 meters, it seems like fun - and it is. There's a competition here; another one there. You get a program - or two, or three. You get a costume or two. You get a DVD (it used to be VHS copies of which we have three large boxes in the garage waiting to be transferred) and you come home with a hundred or so stuffed animals. Local events are usually within driving distance. It's a weekend jaunt; a fun and exciting getaway. But as you head into the second 100 meters, the drives get longer; the stays get longer. The expenses grow and the events become spread out over the course of the year. 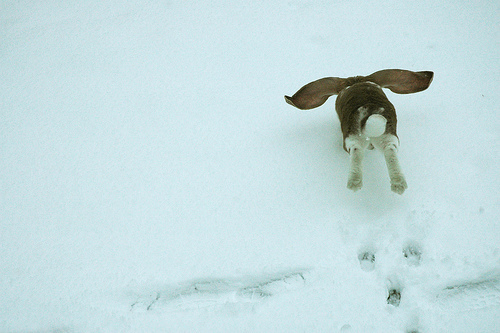 Suddenly, you're racing through the season. There is no summer, fall, winter, spring; there is Summer Skate, Fall Classic, Winter Invitational and Spring Fling, or any manner of names for these events that allow skaters to test their mettle for medals - though the focus really should be about growing in the sport, not just about gaining hardware for the mantelpiece. In the third 100 meters, you are breathing hard. Your heart is pounding. No matter what the level of competition, every mile is either increasingly euphoric or painstakingly excruciating. Like the rabbit in the race, you rush from one rink to another, one competition to the next - and in some cases from one coach to another -in search of maintaining an elusive state of elation. You run on high energy, high caffeine and even higher amounts of dwindling cash. Like an extreme athlete, you become an "adrenaline junkie" looking for your next competition fix. The difference is you're the support, not the participant. It's easy to lose sight of that. Did I? Of course. Does that make it okay? No. Life has a way of teaching you things if you choose to observe, listen and learn. We found out firsthand that over-training and over-use leads to injury. We learned that it was important to listen to doctors, physical therapists, athletic trainers and sports psychologists, and it was important for coaches to listen to these experts, too. We observed overzealous and tyrannical behavior on the ice and in the stands. Along with that came the comings and goings of many extremely promising and talented young skaters who grew up and out of the sport for a variety of reasons, not the least which was burnout. As we look to the last meters of our skater's personal 24K in this sport (though his competitive finish line is still not in sight), we've learned that for athletes and their support crews, marathons require patience, planning and intestinal fortitude. You cannot sprint a marathon and expect to survive. 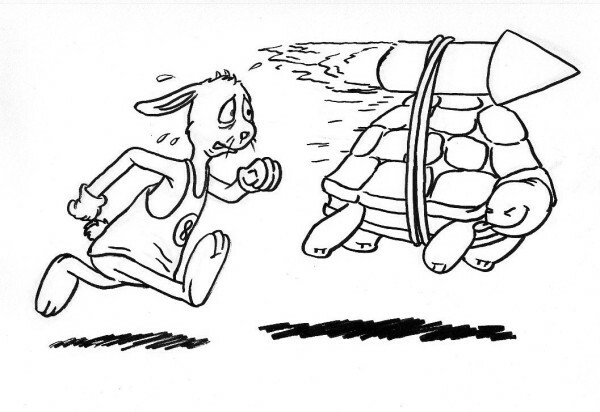 Like the tortoise, taking a slow, steady, well-trained and carefully calculated course can keep you in the race. So, as you head into whatever mile of this race you find yourself on, remember to breathe, step back and make a plan that takes into account your skater's ability, desire, physical aptitude and his or her long-range goals. It's a team effort, and if you keep that in mind at all times everyone will probably reach a satisfactory and healthy finish somewhere down the line. However, If you only look at short-term gain without a realistic, flexible long-term plan, I can promise one thing - you and your skater will most likely be Hare Today and Gone Tomorrow. After 3 years she is starting to explore her options - I now have a Girl Scout and will be chaperoning our first field trip next Saturday! (t has been difficult to sit back and give in to the other options, but ultimately she needs to make the choice. She has set her goals (short term, year-end and long term) while sitting with Dad and has shared them with her coach. I will plan her year according to what she wants for lessons and other activities. I think she will learn she needs to adjust her "other" activities or her goals, but that will be her decision. I will admit I am happy to NOT see Nationals or Olympics in the long term goals. I am not sure we are a family made for that wear and tear. I do not know where we are in this marathon, but I am going to enjoy every mile of it. The mile may be the long trips to see her primary coach, the little home town competition, the local ice show, or the landing or her "stupid" axel (readers of IceMom know what I am talking about. We must enjoy every mile because I unpacked the Halloween decor this weekend and was informed neither child cares if we go Trick-or-Treating, which tells me they have already grown-up! Excellent! Thank you! As "sag" (literally) wagon for my marathon skater, I find that I learn something each time he competes in these qualifying competitions. As he learns, I do too. It is easy to have doubts and worry when other skaters pass my own in competition, and keeping perspective and his long range goals in mind is difficult during the immediacy of the contest. Like my skater, I find that as a parent, I must also do mental training--to be his rock until he is mature enough to do it without me. I'm the blind leading the blind, but thank goodness we have a long road ahead so that I have more chances to improve as time goes on. Just like my skater. We watch as other really talented skaters drop out. Mentally it's such a tough sport. I thank you for sharing your wisdom with us so that we can stay in the race and enjoy the process instead of focusing on the outcome. This is heartening. It is nice to see posts from both sides of the course. Both are equally valid and both are WELL understood. We don't run the same race. Our skaters' competition is only themselves, not the others on the ice. That's the absolute truth as I know it. You both have clear vision, as do your skaters. Keep an eye on whatever prize THEY choose, not you. If you don't forget that, you'll all cross the line as winners. We observed overzealous and tyrannical behavior on the ice and in the stands. Most of these people tend to drop out sooner rather than later; however, some cling to the sport and their fanaticism. I worry about the kids. Thank you, Allison, for the reality check. It must be very hard to keep a healthy perspective when your skater is so successful and is in the public eye. And...it must be hard not to bite your nails to the quick. Ice Girl's very good friend was in finals at Regionals last week. I monitored via IceNetwork.com and was a wreck all day long. I can't imagine if it were my kid out on the ice, at that level or at the level of your skater. I would have no nails and no hair. But I would be so thin/ Who could eat with that pressure? Apparently (and unfortunately) the eating part is not a problem for me. <*sigh*> It is particularly difficult since I have essentially a desk job and both of my kids are athletes. My daughter, Gwen, is constantly on my case about exercise and I am getting better. My personal goal: 15 by Nationals.